Our estate, nestled in the Alpilles wooded hollow, is in the heart of the AOP (protected label of origin) territory of the "Vallée des Baux". 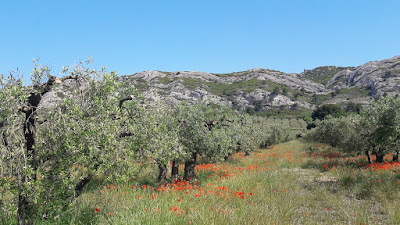 We produce olive oil and grow our 3000 olive trees with passion. 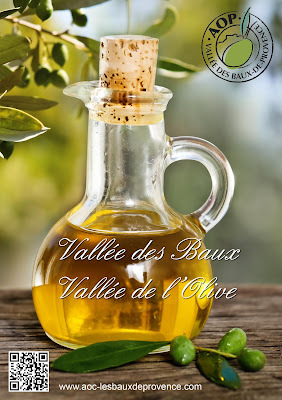 Ripe Fruity Olive Oil 0,25 L Bottle This oil is a blend of all the varieties picked throughout the harvest. Its taste is soft at first with a hint of almond and hazelnut followed by the aroma of artichoke. It is ideal for mixed salads and vegetable dishes. This oil is a blend of all the varieties picked throughout the harvest. Its taste is soft at first with a hint of almond and hazelnut followed by the aroma of artichoke. It is ideal for mixed salads and vegetable dishes. Invite Provence for Christmas ! The olive tree is a rich tree. It can be used in many ways : food, combustible for lighting, care for skin, treatment against colds, decoction for herbal teas efficient against hypertension. 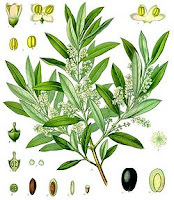 The olive oil was recommended to fight aches and prepared in decoction, the olive tree leaves were used to fight fever. Beauty and Health...100% natural : from top to toe, olive oil brings its benefits ! Your skin is tired ? Apply a compress moistened with virgin olive oil for 15 minutes, then, rince with tepid water. Renew once a week. Mix 50 grammes of cabbage with 2 spoons of virgin olive oil ; apply it on your face for 15 minutes then, rince with tepid water. Tiredness often comes from your poor walking feet after a long day work. Think to them ! Preparation : Mix a good spoon of virgin olive oil with 5 to 6 drops of essential oil of lavender. Before going to bed, massage or have your fette massaged with this decoction. 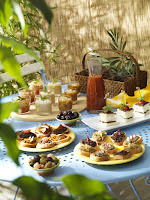 Some ideas for aperitif time ! Bake the peppers in a hot oven. Remove the skins. Drizzle the bread with olive oil and toast in the oven for a few minutes until golden-brown. Rub the toast slices with garlic. Spread the black olive cream, adding pieces of pepper on top. Generously brush olive oil onto bread slices with a culinary brush, grill the slices in the oven. Shred the sardine filets and fold into the olive mixture until you have a uniform texture. Add a little lemon juice and serve on seasoned bread slices. Orders to be placed by email. Payment by check or wire transfer to Mrs Garcin ; Shipment on receipt of the payment. Christine Garcin Mas Saint Roman 13520 Maussane les Alpilles FRANCE massaintroman@free.fr +33 (6) 72 70 80 24 . .